A bicycle designed for multi-uses has my attention every time. Why should bikes to be boxed into categories? They should be able to withstand all kinds of conditions and any seasonal whim. I have been known to take my 8-speed city bike out for a 25 mile ride, and why not? Lately my mixte with 650Bs has been in heavy rotation. From my morning mental health excursion up Look Out Mountain to that ride out to Boulder for lunch it simply suits me this month. I suppose this explains my affinity for Breeze's new multi-tool of a bike, The Road & Dirt Adventure Rig (The Radar). Queen City has been a Breezer retailer for going on a decade primarily stocking their city trekking bikes. Their Uptown model is still the best riding city bike and with its complete city-centric accessory package (read dynamo light system) any city dweller can appreciate the usefulness of the Uptown. When I saw that Joe Breeze is designing adventure road bikes I had to go on a test ride. The Radar’s slack geometry is well designed for touring yet there’s a sportiness to its ride, just in case life’s adventure takes you down a gravel road. You’ll want to take this bike out to complete your weekend errands then go off to explore those dirt trails just east of town. There’s no reason not to because this bike is designed for enjoyment. Although the Radar has a certain gravel bike aesthetic there is no need to put it in that box. It is simply a well-designed bike geared for all around bicycling whims. There are plenty more delights that the Radar offers for it’s not a one trick pony and the price point is pretty to boot. Up for world class adventures? It may new bike time! We have had a number of rewarding bike projects come through our doors in this month ranging from custom light systems to building new custom bikes. It's heartening to see so many of our neighbors out bike riding and commuting despite the short days of the season. Here is a photo montage of an overhaul we just completed for a neighbor. He is the original owner of this classic French race bike. All of the Stella's bike components were removed from the frame, dis-assembled, cleaned, lubricated, and re-installed piece by piece. Our neighbor can comfortably take his road bike out knowing that all of the components have been properly tuned and torqued. original Campy friction shifters work just fine. A traditional 10-speed with a very narrow range was the norm all those decades ago. It does offer a simpler and low maintenance option compared to modern drive trains. What kind of riding do you want to complete, over what kind of terrain? How many miles do you plan to accomplish on each ride? What are your concerns regarding maintenance and safety? Finding a shop that is convenient to your home or work is important but even more significant is finding a shop that is able to listen to your needs. Bike shop owners and employees are enthusiastic about cycling yet cycling can be defined in many different ways. Cycling for some people may be about competition and speed, for others it’s about socializing, and for others it’s just about getting to work. Find a shop that talks your language. Solid bike assembly. Ethan assembles all of the bicycles that we sell, let me clarify, he meticulously assembles all of the bicycles on our sales floor. Proper bike fit. Fit is personal and it may evolve as your fitness level changes. Appropriate accessories. We specialize in urban commuting and bicycle touring. Mechanically Ethan works on all bicycles. Inventory-wise we sell city-appropriate bikes which fit the neighborhood in which we live and work in. We also build custom bikes utilizing steel frame sets. Shopping for a new custom bike is much of the same process as shopping for a new bike except we are going to get a little more personal with you. For a custom build I will measure you (or your frame set) in order to determine which bicycle fits your body type and then there will be a few conversations about your expectations. These conversations will provide us with the basis for offering good component recommendations. Here is a Soma Fabrications's Double Cross bike that we recently built for a neighbor. We left room at the top tube so our neighbor can ride his new bicycle for a few weeks before determining how low he wants to place his handlebars. He may like this height or he may choose to lower the handlebars. A custom fitted bicycle is a process. At Queen City Cycle we are open year round for sales and service. Stop by to chat about your city cycling experiences or just to see what’s new. 303-561-3025.
features a dynamo light system, Japanese components, and hand built wheel set. *for extensive information about dynamo light systems check out Peter White Cycles. The Lisa features a lugged steel fork. Notice the Soma Urban brake levers and the Rivendell Caliper brakes for great stopping power. A junior road bike that rides like an adult steel-framed road bike, it's a Soma! The Lisa is available as a frame set allowing for the freedom of choosing the perfect build kit. For the young lass who will be riding this bike we recommended drop handlebars, bar end shifters, a double chain ring with an eight-speed cassette. Soma also produces The Bart, the same 40 cm junior road bike in Chrome. It was especially fun building this custom road bike. I suppose because we have watched our neighbor's daughter enjoy her first rides as a baby in a Chariot trailer, then as a toddler on her balance bike, on up to the top of an Xtracycle, and eventually on to her own 2-wheel bicycle with pedals. Look out, now she has her own road bike! A Butterfly water bottle cage for a touch of whimsy. being prepared, carry a patch kit and pump. taking a relaxed pace, explore as you go (ice cream shops are always fun)! Perhaps a call to hold on to those classic steel bicycles! want to read a good news story? your bicycle will be meticulously cleaned, partially disassembled, inspected, and adjusted resulting with a bicycle that will perform as new or even better. It pays to be aware of your surroundings. Neighbors of ours were driving through the American MidWest and found this Hiawatha classic cruiser abandoned in a corn field by the side of the road. The Hiawatha suffered from the elements for sure but with our full overhaul package it is now a rideable American classic. When the Seminole Hiawatha was wheeled into our shop it was a bit bent and not rideable. Ethan proceeded to take remove every component from the frame in order clean, straighten, and properly lubricate all of the vital parts. He succeeded in keeping the bicycle intact as a fun, rideable cruiser for the streets of Denver. Our End of Season Sale has begun, all of our 2016 8-speed Breezer Bikes are discounted 20% off. A fantastic incentive to ride more wouldn't you say? 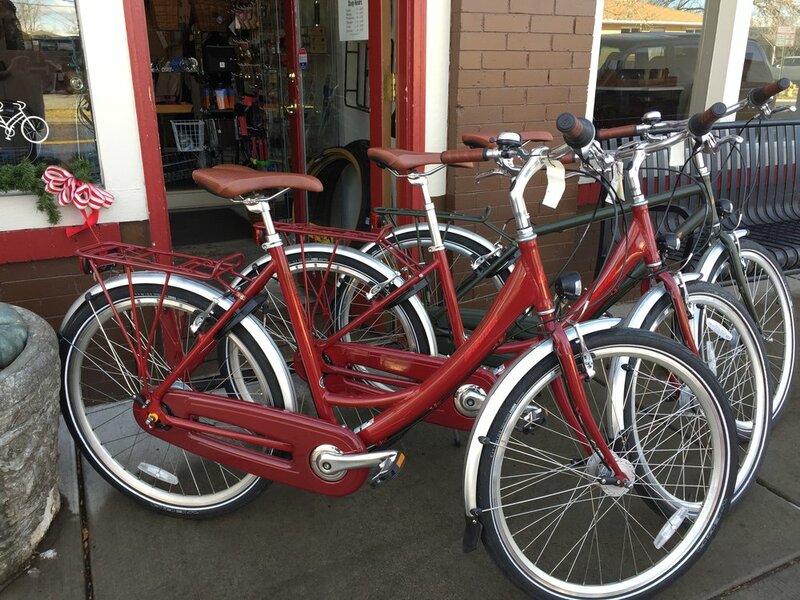 Stop in for a test ride and we will tell you all about the wonderful attributes of Breezer's city bicycles. A beautifully lugged frame set combined with a classically designed component package makes for a bicycle meant for riding. A beautiful bicycle isn't for "cruising" around town no this bicycle is built for daily riding; day or night, rain or shine, asphalt or gravel, there is no stopping the Cheviot. SON rear light tucks nicely in the NITTO rear rack. Even fully loaded this German made light will shine brightly at night. This Rivendell owner had certain ideas for his new bike build, of course we had a few suggestions that were well received! This bicycle purchase wasn't made on a whim, every component piece was deliberated upon. For sure this new machine will enjoy many miles with it's owner. A neighbor brought in this American classic in hopes of making it rideable once again. Clearly this bicycle is well worn yet still loved for it once belonged to his father. We decided to overhaul the key components just to keep things lubed and working appreciating those details that were once so commonplace on our everyday bicycles. Chain rings used to be a detail that bicycle manufacturers could display some style. I have seen birds, stars but hearts may be my favorite. Why did this fall out of standard? A bit lopsided but amazingly comfortable and very irreplaceable. LaSalle bicycles from Chicago IL. We replaced the unsafe, broken pedals with a new pair of rubber block platforms. 37 years ago this tandem was presented to a well loved mum, all these years later she brought it in for us to restore. Keep on riding! All components were overhauled and repaired. New items include: brake pads, tires, front basket. We are considered the go-to-shop for classic bike restoration. Our favorite revival of the week is this Panasonic steel road bike from the 1980s. Japan was the major importer of road bikes into the U.S. during the 1970s-1980s and it is always a kick to find one at a local yard sale. This type of road bike can be a reliable mode of transportation with proper maintenance. If you purchase a used bicycle, such as this Japanese Panasonic, plan to have the bicycle tuned up and you may need to purchase new tires, inner tubes, cables/housing, and brake pads, especially if the bicycle in question was only gently used. Consider this is a small investment for such a stylish ride. There are a great many vintage steel road bikes out there, if you purchase a new-old bike we urge you to choose Queen City Cycle for your repair needs. We offer free estimates and I think you will enjoy the end result.